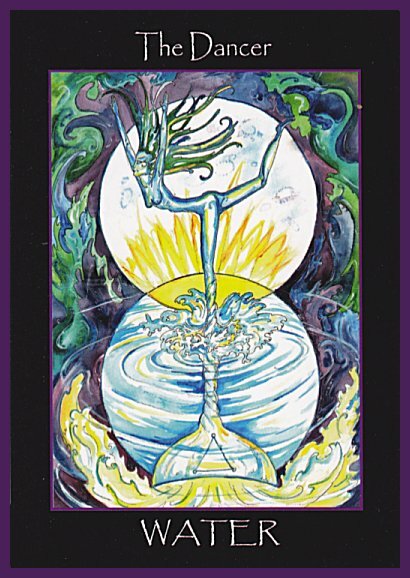 Today's Draw Classic*: The Dancer/Water from Tarot of the Sidhe from Emily Carding. Do you ever think of yourself as a spirit having a human experience? If so, how much of you is spirit and how much of is human while you're here? And do you think your spirit ever misses being spirit? So I have this thing where I cry when I'm watching TV. I cry at Secret Millionaire when the millionaire has that moment when they change from "I'm really rich and want to give money to poor people on TV" to "these poor people are better people than me and I'm humbled." I cry on America's Got Talent when someone gives a performance that is clearly channeled from God. I cry on Shark Tank when someone gets a good funding deal for their brilliant invention. I watch every week and cry and cry and cry. Introspective person that I am, it drives me crazy WHY I cry. Is it because I'm a sap? I don't really think so. Is it because I sit on my arse watching TV while those people are out there actually doing things? Well, no. I manage to run my own freelance business, teach twice a month, do some professional tarot reading and write books on the side. So it's always vexed me. Why? Well, today I think I found the answer from a conversation I was having with an old colleague of mine. And also from today's card. The Dancer is connected to the universe. To the sun and moon. To earth, water, air and fire. To the rhythms and cycles of the universe. Like the water from which she arose, her spirit conforms to fit its container. She is in the world, but not of this world. There is more to her universal connection than meets the eye. Being human means forgetting who you are. We let our bodies define us and our boundaries. We let our minds define what is possible. And we forget that we are spirits having a human experience. We forget that we are spirits, born of the god energy, at one with all that is. Based on that, I've decided why I cry. I cry because, in those moments, those people are operating as spirit in human form. If even just for that split moment, they've remembered who they are and its as if their body disappears and their spirit comes through. I cry, not so much because they've remembered, though, but because I recognize them. I remember who I am through them. Perhaps not consciously, but on a spirit level. We walk the spiritual path to find our way back. We seek that reunion and catch longer and longer glimpses of it, but we inevitably return back to remembering that we're here to have that human experience, with all the stresses and frustrations and separation that comes with it. The older souls may be able to experience more oneness here on earth, but they're also cursed with the wisdom of knowing that spirit...that connection...is just part of who we are when we're here. Like the lady in the card, we're spirit, we're human, we're everything at once. That's the part of our journey the cards want us to consider today. So I'm thinking maybe when I see people having moments where they step into their highest selves, I remember. I recognize them as myself, from when we were the whole. And I miss that iteration of me that didn't have to remember because I was always there. That could also very well be, Ellen. Thanks for that observation. I know a lot of times when I WANT to cry and don't, it's usually from feelings of stress. So those tears could just be the sublimated stress or whatever coming out. Thanks!